In what's likely to be the next in a string of bestselling marketing guides (after Purple Cow), Godin compiles entries from his popular blog. Many are only a few paragraphs long, though he also adds longer entries, from his Fast Company column, to the mix. The pieces are arranged alphabetically by title rather than chronologically, leading to occasional choppiness, but Godin's ability to hone in on key issues remains intact. Following up on the themes of his earlier books, he reminds readers that the first key to successful marketing is to produce something remarkable and let it grow. "If your idea is great, people will find you," he advises. He urges people to take control of their creative lives by taking responsibility for tough decisions and pushing themselves to make bolder choices. Godin, author and business blogger, presents a collection of essays that are thoughtful and wise. 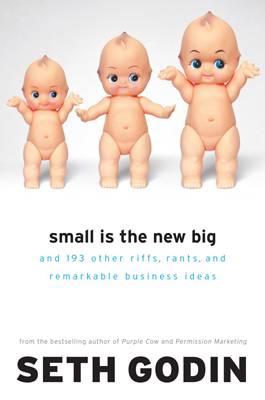 His ideas are skillfully presented with themes that include being big is no longer an advantage, so act small if you want to be big; with instant communication, lies get exposed faster than ever; consumers are more powerful than ever; and Aretha Franklin is correct: respect is the secret to success with people. His comments on business schools are challenging and contain his list of five things that help people succeed, including finding, hiring, and managing extraordinary people; embracing a changing world while effectively prioritizing tasks in it; and the ability to sell. Readers skip his riff on Web design and strategy at their peril. Along with his definition of velocity--a company's ability to zig and zag and zoom or change with speed--Godin tells us, "Give me five serially incompetent executives with a focus on velocity, and I can change the world." Excellent.